Nintendo's latest in the 'Touch! Generations' series hits the DS. Is this the puzzle game to beat all puzzle games? I'm not sure about you, but I love a good puzzle. Have done for years. When I was a kid, I used to love jigsaw puzzles. Nowadays, I don't like to do anything on a Sunday before finishing the Daily Mirror's Sumdoku puzzle. It's like Sudoku but way harder! I'm also a huge game fan, all the big blockbuster games are right up my street. Puzzle games though, are generally not my cup of tea. Why is this, you may wonder? Well, they aren't 'puzzley' enough! Take your basic Tetris game as an example. Yes, you have to arrange the tetroids into the gaps to make lines, but it's all got to be done super quick, with an ever increasing rate of gravity. Where's the thought involved there? Why can't they bring out a game that doesn't rush you and does require some puzzle solving! 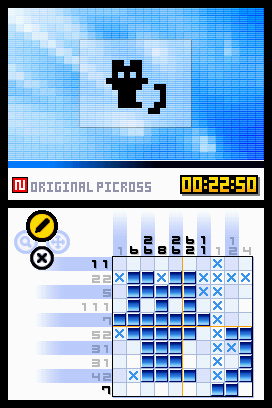 Well would you believe it, Picross DS fits the bill perfectly! Picross puzzles, also known as nonograms (wikipedia tells me) are logic puzzles where you use number clues to paint a picture. The name 'Picross' comes from PIcture CROSSword, clever eh! Using these clues along the top and left edges of the grid, it is possible to logically determine which squares must (and cannot) be filled in. When all the correct squares are filled in, the puzzle is complete. Like Sudoku, these puzzles can all be solved by logical thinking, no guesswork is required to complete a puzzle. 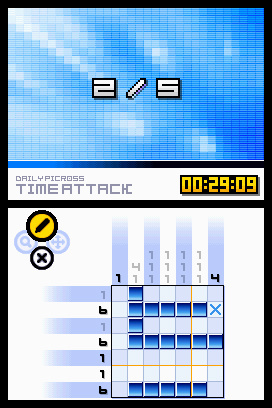 In Picross DS, the grids start off small, only five by five squares. But before long, you will be hooked on the largest: twenty five by twenty square puzzles. Being on the DS, the touchscreen is used to full effect, with a fast, great feeling way of filling in the grid. Howevr, if the touchscreen is all too new for you, it is possible to go all 90's and use the D-Pad and buttons to play the game. There are a few different modes to the game. 'Picross' is the standard play mode, with a short tutorial and then 3 difficulty levels: Easy Mode, Normal mode, and Free Mode. In the easy and normal modes, the game will tell you if you mark a square incorrectly adding a penalty to the timer, this acts as your high score for each puzzle. Free mode shakes things up a bit, by not telling you when you make a mistake! This can prove more difficult, but you won't be making mistakes in the first place by this stage! Also, any accidental slips of the stylus will not be a problem, just remove the marks and place them in the right place. Other game modes include: 'My Picross' where you play puzzles downloaded from Nintendo's Wifi connection, created by yourself or friends. 'Daily Picross' where you can track your progress on different variations of Picross gameplay. The multiplayer mode, which is playable both locally and over the internet. In multiplayer, you must solve three puzzles before your opponent, with any errors freezing control for a few seconds. This is a fun, if shallow diversion to the main single player game. There are over 300 puzzles included in the game, so you will be puzzling for a long time. But when you do manage to solve all of the puzzles, the developers have thought of that.. You can download puzzles from the Nintendo Wifi Connection for free, or can draw your own picture and make a puzzle based on the resulting picture. This can then be shared online to others with the game. The game even tells you the level of difficulty for a home-made puzzle. Only letting you use puzzles that are actually possible to complete without guessing! So how about some opinions.. 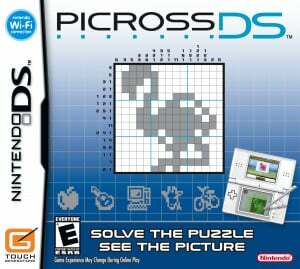 I think that Picross DS is a fantastic game. One of, if not the most addictive games to hit the DS. It has been in my machine for longer than any other game to date and I still have about 5 puzzles left to complete! Anyone looking for an ideal game to waste time with, buy this. Recommended for waiting rooms, long journeys and even bog-side gaming! 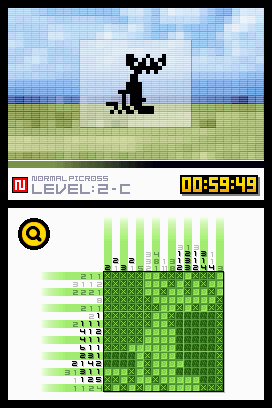 Picross DS is an addictive 'proper' puzzle game, that you won't be able to put down. Wow. I didn't expect that. But I have heard good things about this game. I strongly doubt it's my cup of tea though. You can try them out on sites like wiipicross to see if it's up your street. Just picked this little gem up at Gamestop for $13 used, well worth the price thus far!! One or the very best puzzle games on the DS. 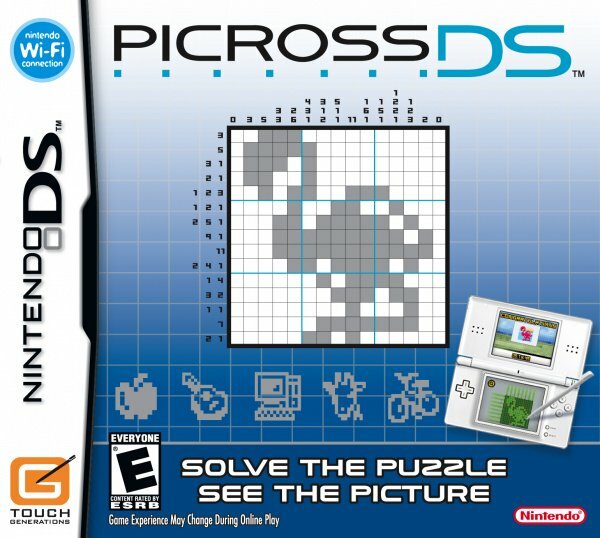 I like picross 3d so i'll probably pick this one up to. it stands number one in my 3ds journal. close to it, Picross 3D !